WE ARE SO SORRY BUT THIS IS NOW SOLD OUT!! HOPEFULLY THERE WILL BE ANOTHER ONE NEXT YEAR! 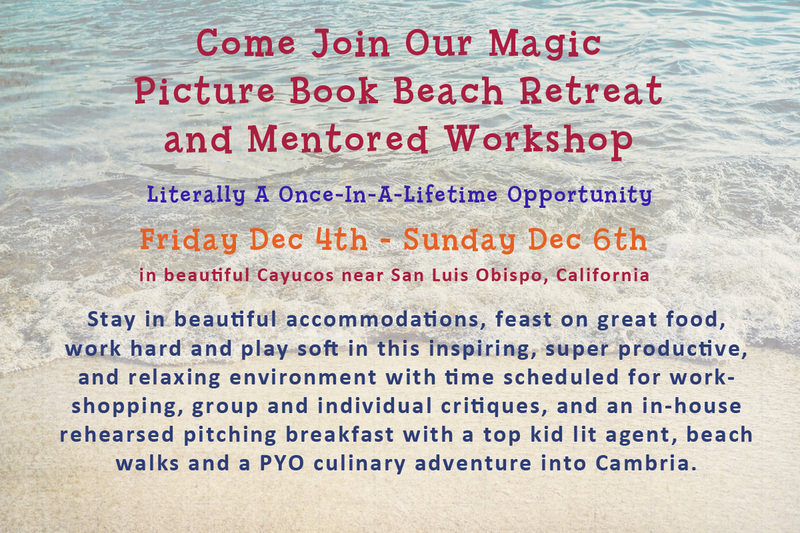 Are you ready for an intimate, inspiring, relaxing yet incredibly satisfying three days of learning, creativity, and finessing or finishing your children's book writing (or art)? one of the top children's literary agents, Karen Grencik of Red Fox Literary, where you'll get to deliver your rehearsed pitches and receive feedback. Amazing things come out of these rare retreats. Mira, Karen, and Cayucos (note the blue, blue skies). So what is included in this wonderful adventure? We've priced this ridiculously low for all that you will receive. And don 't worry, we'll help you organize transportation from San Luis Obispo airport if you come in by plane and we can also help you arrange further accommodations if you want to stay longer. Because this is limited to 12 people, it's a rare opportunity to accomplish a lot and have a great time, so sign up below asap as this will fill up fast. The first six to register will also receive a custom piece of magical art from me and one of my books! Get settled. Relax. Beach walk one block away. • Breakfast with literary agent Karen Grencik followed by a pitch fest with feedback from Karen. You deserve this!! If there's any way that you can spring it, just click the graphic on the left and get the fabulous early bird specials!! Because of the small size, your registration is completely non-refundable, so if you need to cancel for any reason, you'll need to sell your spot to another former student but hopefully you'll be able to join us for this fabulous event while you can. Cayucos is a California original. Born during the days of Spanish land grants, Cayucos grew up with sailing ships and steamers, rum runners and revenuers. Gamblers and seafarers met in the Old Cayucos Tavern, and adventurers and romantics af all kinds still meet there today. Please feel free to contact Mira at mira@childrensbookacademy.com or our host Claire Nolan at claireannette1@gmail.com with any questions or concerns.